Grace to You Episode Reminder Get a sneak-peek into each new show, delivered straight to your inbox! This powerful broadcast will boost your spiritual growth by helping you understand and apply God's Word to your life and the life of your family and church. John MacArthur, pastor-teacher, has been offering his practical, verse-by-verse Bible teaching through Grace to You for nearly 40 years. John MacArthur is the pastor-teacher of Grace Community Church in Sun Valley, California, president of The Master’s College and Seminary, and featured teacher with the Grace to You media ministry. 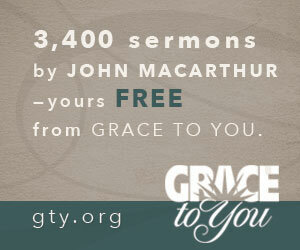 Grace to You radio, video, audio, print, and website resources reach millions worldwide each day. Over four decades of ministry, John has written dozens of bestselling books, including The MacArthur Study Bible, The Gospel According to Jesus, The New Testament Commentary series, The Truth War, and The Jesus You Can’t Ignore. He and his wife, Patricia, have four married children and fifteen grandchildren.